On March 13, 1996, another of the tragic, sad stories about a fatal shooting that took place at a school unfolded when ex-Boy Scout leader, Scotsman Thomas Hamilton, opened fire and killed 16 elementary school students and a teacher before shooting and killing himself. The 17 innocent lives lost are to date the worst British school shooting on record, proving that even in a country with much, much stricter gun control laws than the United States school shooting tragedies can still occur. Dunblane Primary School near Stirling, Stirlingshire, Scotland, was the scene of this horrible crime in which the troubled Hamilton, age 43, committed his atrocity. Hamilton drove to the school and parked his vehicle, cutting the telephone wires at a utility pole before entering the school for his murderous mission. Armed with 2 Browning Hi-Power 9mm semi-automatic pistols and 2 Smith & Wesson .357 Magnum revolvers, there can be little doubt about Hamilton’s intent, especially as he also carried 743 rounds of ammunition! Moving toward the gymnasium, Hamilton fired a couple (or a few) quick shots at a girls’ bathroom and a stage area before entering the gym. Confronted by a female physical education teacher, Hamilton gunned her down and commenced firing on the children in the gym class. Another female teacher was shot dead, and a third female teacher was shot in the legs and the head. The crazed Hamilton kept shooting and reloading, firing something in the area of 100 shots, many at children he had previously wounded that could not run away. The gunman also fired shots at students and teachers in other rooms, hallways, and walking outside. After a brief walk outside the gym, Hamilton returned to the gym where he pulled one of his revolvers and shot himself to death. He had killed 16 children, ages 5 and 6, one adult teacher, and himself. He had also wounded another 15 children and adults in the 3 to 4 minutes that the shooting took place. Dunblane Primary School. Photograph by Dave Coustick. A call to the police went out at 9:41 am, probably about 2 or 3 minutes after the shooting started. When it was apparent the shooting had stopped by 9:43 am, calls went out from the school requesting ambulances. It took at least 14 minutes for the first ambulance to arrive. It is unclear if any police arrived before the ambulance, but in any case, the police obviously arrived too late to do anything other than secure the area and process the crime scene. Other medical crews were also called and dispatched to the school. Tom Hamilton had drawn a certain amount of negative attention to himself by getting a bit too cozy with young boys, including those in the Boy Scouts that he had briefly assisted with leading. He was known to take photos of himself with partially undressed young boys, as well as incidents when boys in the Scout troop were forced to sleep with Hamilton in Hamilton’s van. By 1974, Hamilton was ousted from the Scout troop and declared persona non grata. Later attempts to join other Scout troops were foiled, as were attempts by Hamilton to start clubs for boys. Hamilton complained of police and Scout officials causing his efforts to establish boy oriented groups to be prevented. His letters of complaint about this perceived “persecution” were sent to members of Parliament as well as to Queen Elizabeth II! 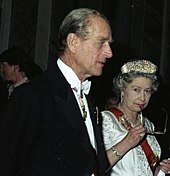 Philip and Elizabeth, October 1992. Photograph by Marie-Josefine Jirka. Of course, the usual gun control hysteria gripped the United Kingdom, and Draconian laws were passed to virtually eliminate private hand gun ownership in the UK. Only single shot .22 caliber pistols were exempt, and those only to be owned by certified members of shooting clubs, the pistols only to be used at such officially sanctioned shooting ranges and events. Soon afterwards, even those single shot .22 caliber pistols were also outlawed (thus obviously preventing other massacres!?). These gun laws left only muzzle loaders and some “sporting” long arms (single and double barrel rifles and shotguns) in the hands of some British citizens. In the typical, sickening manner of non-transparent government, the British government sealed the results of their investigation of the horrible Dunblane Massacre and the background of Tom Hamilton and his history of interaction with authorities. The government hid behind “protecting the privacy of the children” victims in sealing the investigation information, but some of the information was later released, revealing government lack of proper response to previous incidents with Hamilton that should have elicited some sort of intervention to prevent a later tragedy. Government neglect of duty failed to either get Hamilton criminally charged when appropriate from prior incidents or force him to undergo psychiatric treatment. Once again, a government failed to protect its people and failed to hold those bureaucrats that did not properly do their jobs accountable. Instead, the nation was saddled with ridiculous gun control laws that have kept the British people unarmed and unable to protect themselves against the increasing threat of violent criminals and terrorists. This increased threat has been enough to see a dramatic increase in British police armed with firearms, but apparently the British people cannot be trusted with their own defense. 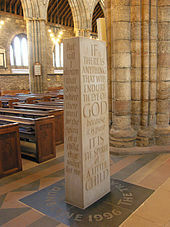 The Dunblane Commemoration standing stone. Photograph by PaddyBriggs. The usual memorials, television shows, articles and books about the Dunblane Massacre appeared, and Bob Dylan even authorized Ted Christopher to write an extra verse to Dylan’s song, “Knockin’ on Heaven’s Door” in tribute to the victims. Meanwhile, in 2019, the United States continues to experience a fierce debate about gun control and whether or not to allow trained teachers to voluntarily be armed in the classroom. Somehow the “voluntarily” part seems to escape a lot of Americans, including teachers, who often stridently complain that they do not want to be armed. (No one is suggesting the arming of teachers other than those that voluntarily ask to be certified to carry a concealed weapon.) In some schools, rocks have been placed in classrooms for teachers and kids to throw at potential gunmen! (Seriously, if you do not think this is stupid, stop reading right now and get help.) Creeps and mentally deranged people that want to attack school children do not necessarily need guns to make deadly attacks (as evidenced by the worst school massacre in US history coming at the hands of a man that used explosives) and relying on the prompt arrival of the police is ridiculously optimistic. Also, the worst school massacre in any country occurred in 2004 in Russia, with 385 people killed! Either having armed police at the school or having armed teachers is needed to counter a deadly threat in a timely manner, in time to prevent further killing and injuring of innocent people once the attack starts. Of course, we recognize that others have alternate ideas about this subject, and all readers are welcomed to comment on the emotional issue of protecting our children in their schools. After the Stoneman Douglas High School shooting in February 2018 resulted in seventeen deaths and seventeen injuries, survivors of the shooting led a movement against gun violence, leading to the March for Our Lives the following month. Photograph by Ryan1783. Questions for Students (and others): Have you heard of school shootings taking place in other countries? Do you believe schools should hire armed police or security guards at schools? Have you ever heard of attacks on school children that did not include the use of firearms? Aylward, Peter. Understanding Dunblane and other Massacres: Forensic Studies of Homicide, Paedophilia, and Anorexia. Routledge, 2018. Langman, Peter. School Shooters: Understanding High School, College, and Adult Perpetrators. Rowman & Littlefield Publishers, 2017. North, Mick. Dunblane Never Forget. Mainstream Publishing, 2000. Sotos, Peter. Predicate: The Dunblane Massacre: Ten Years After. Creation Books, 2005. The featured image in this article, a photograph by Dave Coustick of Dunblane Primary School, is licensed under the Creative Commons Attribution-Share Alike 2.0 Generic license. This image was taken from the Geograph project collection. See this photograph’s page on the Geograph website for the photographer’s contact details. The copyright on this image is owned by Dave Coustick and is licensed for reuse under the Creative Commons Attribution-ShareAlike 2.0 license. Previous ArticleHistory of The Word Marijuana & Why We Don’t Use It?